Queen of the Valley Hospital in West Covina has been accredited as a Center of Excellence in Robotic Surgery (COERS) by the Surgical Review Corporation, becoming the first Los Angeles County hospital to have achieved the designation. It is one of five COERS hospitals in California. “This important designation reflects our commitment to deliver the safest, best-in-class care to our robotic surgery patients,” said Rob Curry, president & CEO of Citrus Valley Health Partners, the health system that operates Queen of the Valley. Surgeons who have also been accredited as part of the Center of Excellence include: Dr. Edward Tangchitnob (Gynecologic/Urogynecologic Surgery); Dr. Dumrong Tangchitnob (OB/GYN); Dr. Robinson Baron (General Surgery); Dr. Ramin Mirhashemi (Gynecology Oncology); Dr. John Y. Lee (Urology); and Dr. Sung M. Choe (Urology). 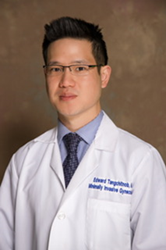 Dr. Edward Tangchitnob was also certified as a Master Surgeon in Minimally Invasive Gynecologic Surgery. “We are proud that our robotic surgery program is being recognized for its safe and superior outcomes,” said Dr. Tangchitnob, who also serves as the hospital’s medical director of the Minimally Invasive Gynecologic Surgery program. The hospital has been on the leading edge of technolgy when it comes to treating gynecologic procedures with robotic surgery, such as hysterectomies and uterine fibroid removal. Since 2014, Queen of the Valley Hospital has been an officially designated as a Center of Excellence in Minimally Invasive Gynecology (COEMIG) by the American Association of Gynecologic Laparoscopists ( http://www.aagl.com) and the Surgical Review Corporation ( http://www.src.com), which have partnered up to promote excellence in minimally invasive and robotic surgery worldwide. This program uses a hospital-wide approach to promote minimally invasive gynecologic and help robotic surgeons continuously improve quality. Chief Medical Officer Dr. Gurjeet Kalkat said that Queen of the Valley offers innovative and comprehensive care because it understands women have unique health concerns. The robotic surgery program has helped to enhance the hospital’s services for women overall, resulting in two prestigious national women’s health care awards from a leading online consumer rating services for physicians and hospitals. Healthgrades honored the hospital with two of its top awards – the Labor and Delivery Excellence Award™, as well as the Obstetrics and Gynecology Award. These awards place Queen of the Valley Hospital within the top percentage of all hospitals evaluated for the exceptional care of mothers during labor and delivery, as well as women undergoing gynecologic procedures. According to Healthgrades, the Obstetrics and Gynecology Excellence Award™ designates hospitals where women have fewer complications from their obstetric and gynecologic surgery. Studies have also shown that women have a 53.8% lower risk of experiencing a complication if they are treated in hospitals that have earned Healthgrades’ Labor and Delivery Excellence Award. For more information about Queen of the Valley’s Women’s Health services, visit http://www.cvhp.org.